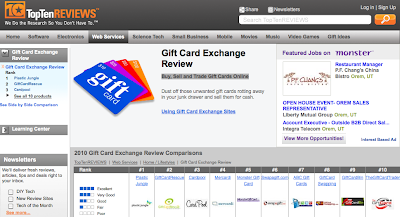 I recently finished another review for TopTenREVIEWS, this time on online gift card exchange services. Did you know that you can sell your unwanted gift cards for cash? Neither did I! The days are over when gift cards sit unused, gathering dust in drawers and taking up space in wallets. Gift card exchange websites are taking those unwanted gift cards by storm, trading them in for what you really want or sending you a check instead. There are actually several places to get rid of your unused gift cards, but my top picks are Plastic Jungle, Gift Card Rescue and Cardpool. The process is simple really. All you do is find the site that gives you the best trade for your gift card, send it to them and in a matter of a week or so, you receive a check in the mail. Read my reviews of each site before choosing. I have created a side-by-side matrix where you can compare each site. I love doing reviews like this because first of all, I had no idea this kind of service even existed and secondly, I get to share my new knowledge with all of you!